Thank you for supporting TJ’s ArtFest! We want to say THANK YOU to everyone that came out to support TJ’s ArtFest either by shopping, organizing, donating books, volunteering, telling your friends and family to join you, or selling your fabulous wares to our community. We couldn’t keep up this incredible yearly event without your support!! If you have any general comments, want to request your favorite vendor/maker/author be invited back next year, etc., please feel free to e-mail the ArtFest committee at tjsartfest@gmail.com. For three decades, ArtFest has featured some of Denver’s greatest creative talents including fine artists, photographers, sculptors and jewelry makers as well as local artisans selling everything from decadent holiday treats and small-batch organic eats to homemade soaps and scents. Purchases of unique holiday gifts benefit teachers and students alike. ArtFest is a major fundraiser for the TJ community, providing funds for classroom grants. The event takes place in TJ’s beautifully transformed gym, with a used book sale, and the Kidzone adjacent to the gym where kids can be creative and have fun while their parents enjoy the leisure of holiday shopping without the mall madness. 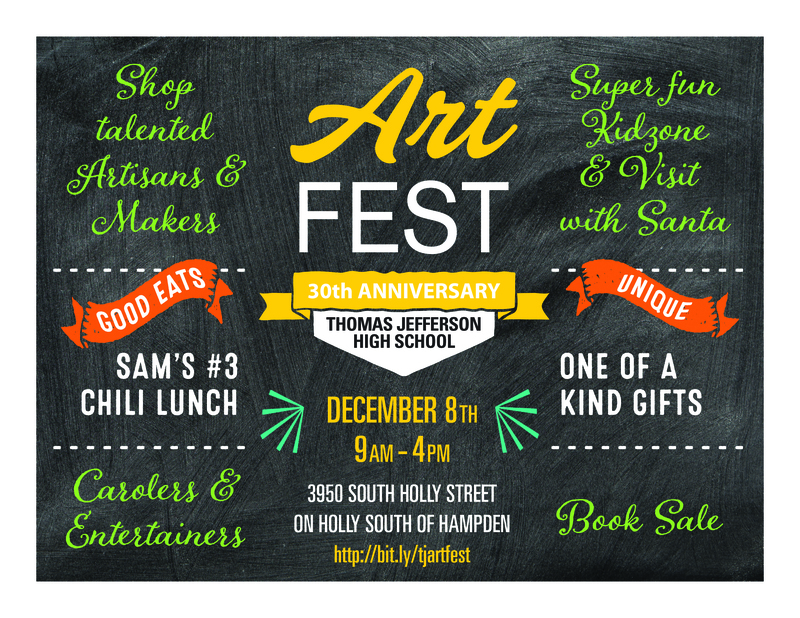 Attending ArtFest is a great way to kick off your holiday season!